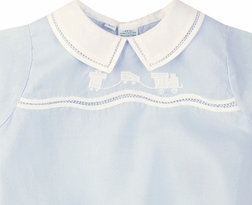 Home > Babies & Infants > Baby Clothing, Gowns & Layettes > INFANT BOYS > Feltman Brothers Bubble for Boys in Blue with Embroidered Train. 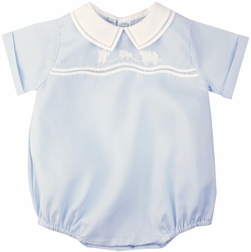 Here we have a precious blue train bubble for baby boys by Feltman Brothers. The Bubble has a white entredeaux decorated collar, and is shadow embroidered with a choo choo train.